The Robert W. Chambers Science Fiction Collection was donated to Concordia in 2012. It consists of pulp magazines from the 1920's through 1950's, fan zines, and books from the late 1800's through the 20th century. There are multiple ways to explore the collection in the library catalog. To browse the entire collection (thousands of items), do a keyword search for "Robert W. Chambers Science Fiction Collection." "Science fiction -- history and criticism"
And of course, searching for particular titles and authors! Ray Bradbury - Like many sci-fi/fantasy authors, many of his early short stories and serialized novels appear in the pulp magazines. There are also early editions and signed copies of many of his books. Hannes Bok - An important illustrator and friend of Bradbury's, Bok's illustrations grace the covers and dust jackets of hundreds of novels and magazines. 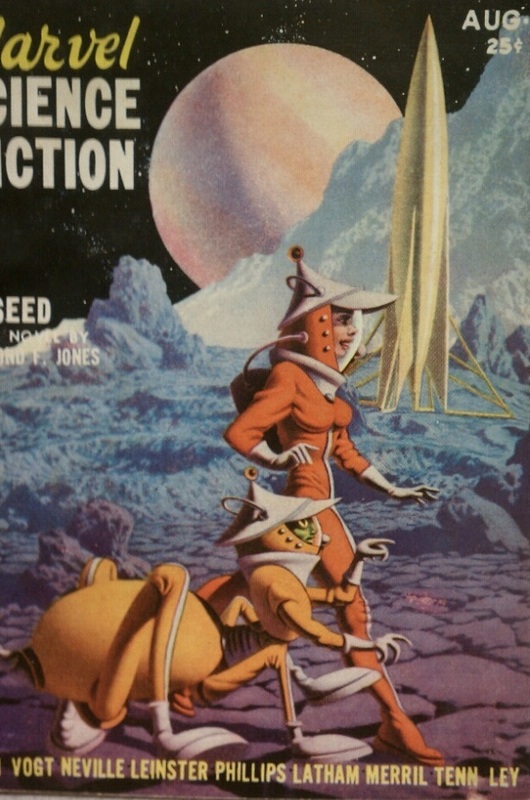 These have been noted as much as possible in the records for books in the catalog, but check out the "More resources" link for sites that index Box's work and tell you where to find his illustrations in the pulp magazines. Fanzines - How did fans of anything communicate before the Internet? They wrote letters, reviews, and fan fiction for each other in newsletters. These were usually produced irregularly and in short runs. The collection contains dozens of examples of these. Hannes Bok, cover for Marvel Science Fiction.